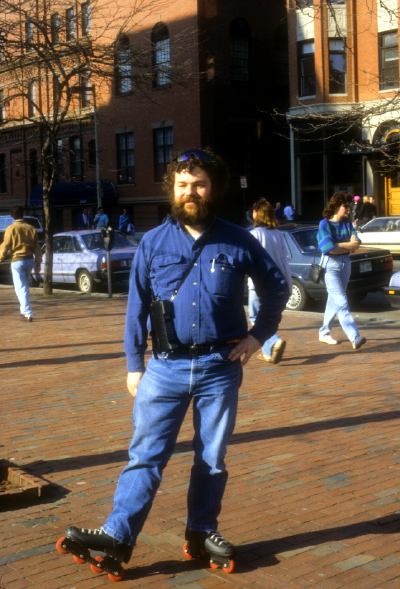 On this page we have some maps and logs of fun places to skate, mostly in Boston and Cambridge. DPV and I did this tour on 23 Nov 2001. This is almost entirely parkland for the whole route. The yellow line is a possible alternate to stay inside the park a little bit more. We came back through the linear Southwest Corridor Park. I did this alone on 28 Oct 2000. I thought it was going to be a nice day, but the temperature dropped suddenly. I nearly froze coming back along the Esplanade, and finished by taking a short cut through Cambridge to get back to my car. This is a proposed combination of the above two loops. The jaunt across Brookline is a portion of the thirty-four mile trek that I used to do beginning in Bedford on the bike trail through Lexington, Arlington, Allston, Brookline, Jamaica Plain, Roxbury, the South End, Beacon Hill Cambridge, and back out to Bedford. 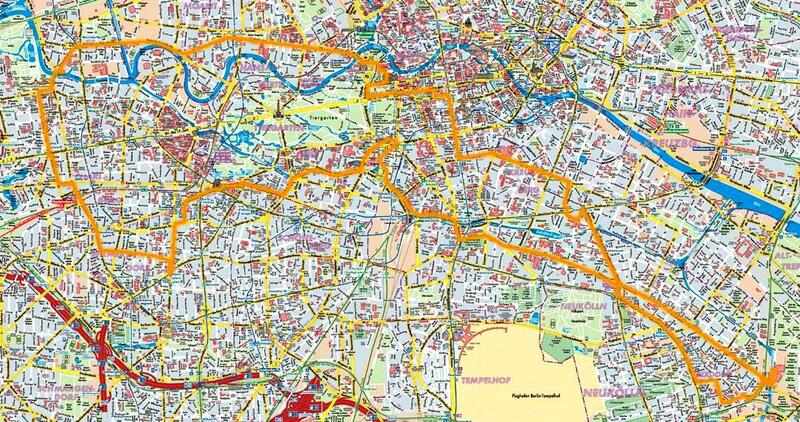 PSH and I did this short loop on 26 May 2001. I did this 25 mile tour on 28 April 2001. 5 July 2002 - 8 mile loop. London: Chelsea, Thames, Tower Bridge, City, Seven Dials, Soho, Whitehall, St James's Park, Buckingham Palace, Belgravia. 14 July 2002 - 3 1/2 hours. 21 July 2002 - 12.75 miles. With Brandy and Michael Geis. 31 August and 14 Sept 2002 - 22.6 miles round trip. This is a very nice trail entirely through woods with very few street crossings. Pam accompanied me on bicycle. The GPS track log shown was made on 14 Sept 2002. We now skate this trail often. There are nice parking lots at the ends and at several of the crossings along the way. The Ayer end is directly opposite the commuter rail station. 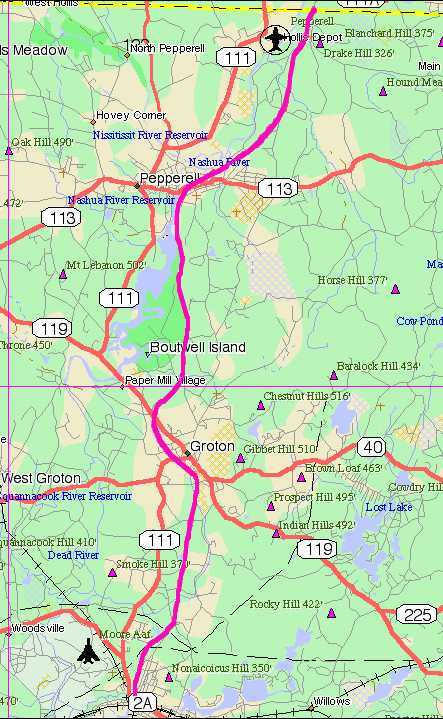 In 2002, the north end of the trail was at the New Hampshire border, but it has since been extended another quarter of a mile to NH 111A. In the business center of Pepperell there are several convenience stores (some with good deli sandwiches) and an ice cream shop. 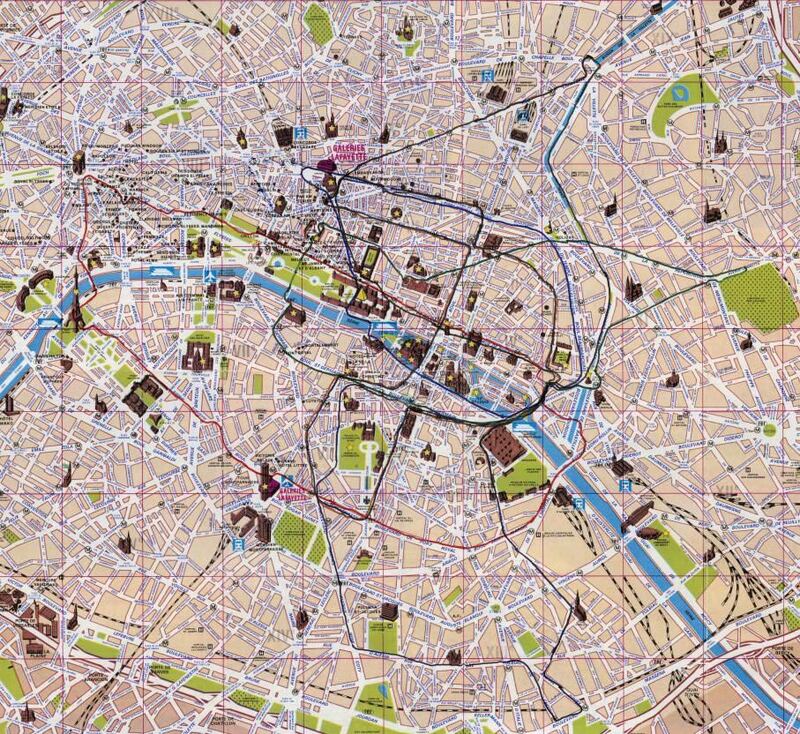 Pam and I went to Paris from 24 November to 1 December 1991. Every morning, I would get up at the crack of dawn and rollerblade for a few hours and then pick up nice cheeses to bring back to the hotel to augment their sparse continental breakfast. There are six loops shown here. 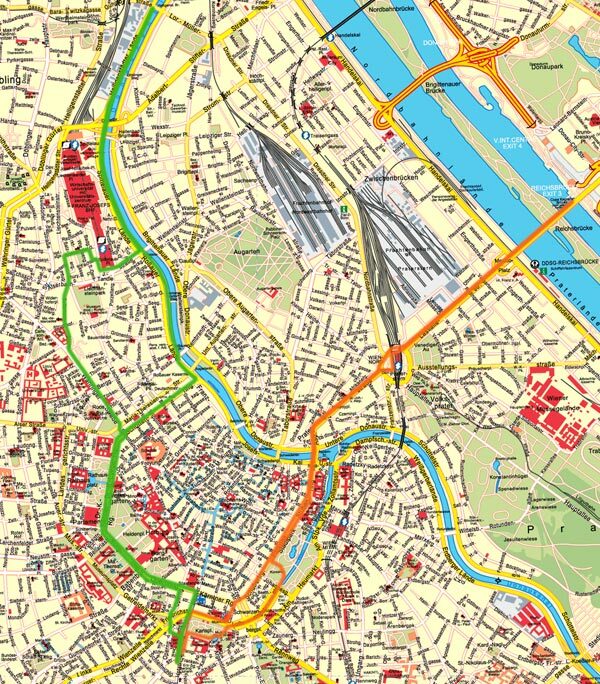 During our 2006 vacation, Peter Ranisch took me on two grand tours of Vienna, each about an hour and a half, on the mornings of 15 (orange) and 16 (green) July.